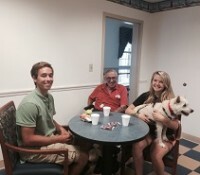 We always welcome family pets visiting our Lighthouse Community. We have Pets on Wheels who make their weekly visits and we have many family members who bring in their special pets to share with our community members. A pet can always bring a smile to our residents.